Over 60 workers at a Lautoka company which exports live coral and rock have been told not to return to work today. This comes after the recent ban that came into place on December 28 last year which prohibits the sale of these items. The workers, all part of Walt Smith International were told by the Livestock and Aquaculture manager David Barrick that it was something which the company could not avoid. When contacted yesterday, the Minister for Fisheries Semi Koroilavesau said the ban was in place. “However I am supposed to meet with these exporters next week to see how we can work things out. “I am surprised they have sent the workers home as we are supposed to meet and discuss this issue,” Mr Koroilavesau said. Mr Barrick said the company was notified through the Ministries of Fisheries Facebook page on Friday at 7pm. “Nobody informed us when we called on Friday or Monday and nobody had any idea what was going on. “Our business is a lot more than about coral and rock export but the coral and rock export is what supports our coral farming and our man made rock – without that we can’t stand alone. 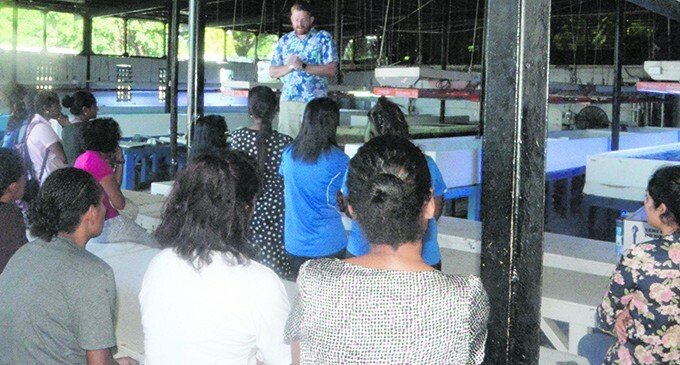 “At least right now for the last couple of years, a quarter of our income has gone directly to the villagers in Navutu, Druadrua and parts of the Yasawas to support the coral farming and the villagers are paid directly for the boat hires and other stuff,” he said. Mr Barrick said the company had invested another $500 000 last year with the same amount earmarked for next year. Over $15 million was invested into the company over the past 20 years. The company said it contributed between $6 million to $7 million towards the economy each year. “There was zero consultation with us and the other company in Pacific Harbour that is run by David Oliver. “It came to us as a complete surprise and we haven’t slept since Friday,” he said. The Ministry of Fisheries has banned all harvesting, purchasing, sales and export of live coral and aquarium rock (also known as live rock, coral rock or fossil coral). νAll harvesting, purchasing and sales of live rocks and live coral are now banned, and no export permits would be processed by the Ministry. νThe Convention in International Trade in Endangered Species (CITES) Scientific Committee (SC) will be submitting to the Management Authority (MA) on January 7, 2018 that Live Coral and Live Rock is given a zero quota for 2018.
νThe Ministry of Fisheries and both the CITES, MA and SC would be supporting the development of other sustainable options, particularly the development of farmed or cultured coral. In 1998 Walt Smith developed the first coral farm by taking small clippings from larger colonies of live coral and planting them into specially designed plugs that he designed and manufactured at his export facility in Lautoka. The plugs were then attached to iron racks placed on the sea bed for a period of time to grow. Once the growth was noticeable (about three months), they were then transplanted to the nearby reef. Since that time more than 1,500,000 new corals have been planted in various locations in the Yasawa Islands, Vanua Levu and recently the Mamanuca group. Every year, in late October to early November, the planted corals spawn yielding an unprecedented number of offspring and creating generation upon generation of new coral clones on the reef. According to WSI, it was noticed that some of these clones were showing resilience to global warming. The company said this was evidenced on a large farm site in the North where a completely dead reef had been rejuvenated with thousands of newly planted coral over the last five years with some reaching over a meter high and that the fish population has returned. Mr Barrick said the company had not gotten any word, so their only option was to minimise staff until they were told by Government on what they could do. “Exports currently in our coral warehouse alone is worth around USD$14,000 or FJD$30,000 and we can’t do anything. “Between this facility and our Labasa facility there are 94 full time staff. “We also have a lot of casual workers that we pull from the villagers so in total, there are 100 staff and 100 villages that we support. “It is safe to say that we cannot continue anything without being able to export,” he said.